D was not thrilled at the prospect of moving to Toronto though it was his job moving us! We are insistent that we want to live in a part of the big city that still offers that 'village' feel. Green tree-lined streets, variety of people, grocery stores, restaurants, specialty stores all withing walking distance. The idea of weekends driving from box store to box store in some cookie cutter suburb or in some glassed up condo makes me cringe. Roncey sort of reminds of Commercial in Vancouver. EXCEPT! you will not find a Starbucks on it. The area has strived quite hard to avoid the big chains opening up, thankfully. 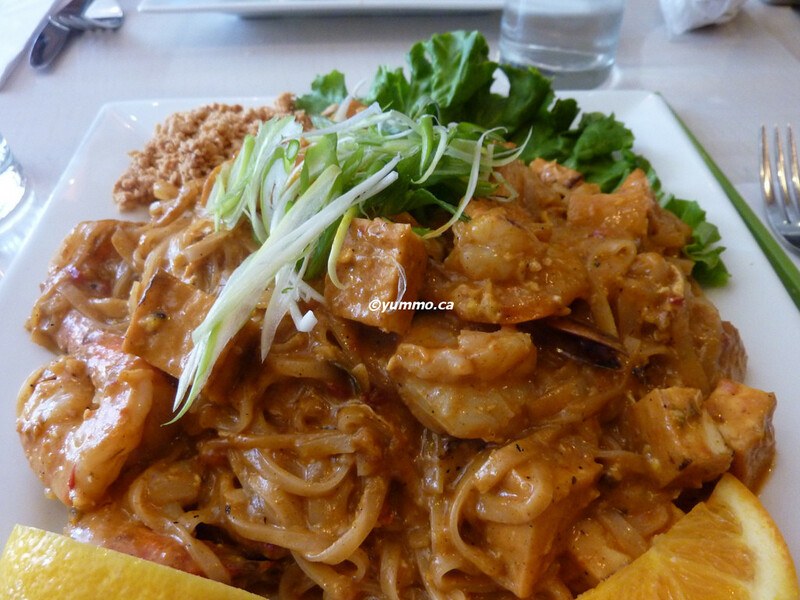 So, woefully as we miss the Wet Coast and the fresh fish, I am glad that Toronto is great for Thai food . IT's everywhere and has a decent range of price and quality. That's been my perception anyway as I've been visiting in and out for the last decade visiting the folks. Vancouver was not so good with the Thai food. We settled on a couple of places as our go-to but, yeah, no where I'd be recommending visiting friends to try as a point of their visit. You'd sooner recommend they try seafood or sushi. There we were after a disappointing round of househunting and we were strolling down Roncey. I popped in and out of cute shops like the Mercantile while D patiently waited on the sidewalk, since we were on a lunch run after all. What was I craving he asked? I said sushi. I am always craving sushi as a default. We walked past one that didn't feel inviting. IT was dark and smelled of old tempura oil... or was it the deli next door grilling Kielbasa on their doorstep. Anyhoo, we walked on. I saw a lunch special sign outside the Friendly Thai for a Shrimp Curry Phad Thai, I was set and so was D.
Oddly enough, he didn't order the special... I grumbled as I thought of all the big houses in High Park we couldn't afford and there goes another 5 bucks :^P. He ordered the Phad Kee Mao or Spicy Noodle. That was odd to me. Though Vancouver isn't great at Thai food, they put the proper names next to the dishes. 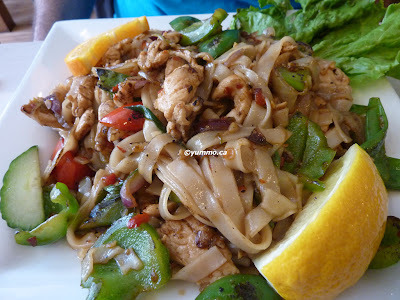 They didn't have D's preferred dish of Phad See Ew, nor did our server know what it was. I suggest the Kee Mao cuz that is normally my favourite because I love the Thai Basil. They both came out reasonably quickly and piping hot. The portions were on the generous side for lunch which pleased me. It wasn't a skimpy lunch special portion. Mine was a luscious coconut based curry Phad Thai heaped with Tofu and Shrimp. The sauce was tasty and just on the right edge of not too rich. D's was really good as well. They grilled all the veg and chicken before stir frying it so it had a nice smokey grilled flavour that went quite well with the sauce. The portions did in the end beat us. Of course we had bought some wasabi edamame at the Mercantile and some baked goods from the girls soccer team having a bake sale up the street. The design is clean and modern without being pretentious. They have a lovely folding door in the front to let the spring in now that days are sunny and blue.